Heat oven to 350°F. Grease bottom and sides of rectangular pan, 13x9x2 inches, with shortening. In large bowl, mix granulated sugar, bananas, oil and eggs with spoon. Stir in flour, baking powder, baking soda, cinnamon and salt. Spread in pan. Bake bars 25 to 30 minutes or until toothpick inserted in center comes out clean. Cool completely, about 1 hour. Meanwhile, in medium bowl, mix cream cheese, butter and vanilla with electric mixer on medium speed until blended. Gradually beat in powdered sugar with spoon, scraping bowl occasionally, until smooth and spreadable. 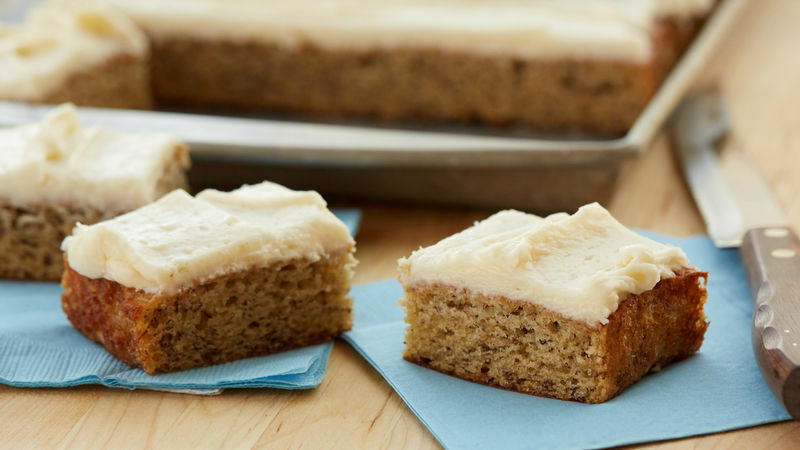 Spread cooled bars with Cream Cheese Frosting. For bars, cut into 6 row by 4 rows. Store covered in refrigerator. You can tightly cover unfrosted or frosted banana bars and freeze up to 2 months.